“The current mutual trade volume of USD 4.6 billion between EAEU countries and Greece is clearly not consistent with the scale of our close economic ties over many years. It can and should be more”, Greek Alternate Minister of Foreign Affairs Georgios Katrougalos said opening the forum’s plenary session. More than 200 people took part in the event: representatives of major business associations, leading companies from EAEU countries as well as delegations from the governments of Armenia, Belarus, Kazakhstan, Kyrgyzstan, and Russia. The participants shared ideas for cooperation in such sectors of the economy as transport, agriculture, and trade. “I think this is a very timely forum, when both Greece and the economies of our five countries are entering a phase of economic growth. We are confident that a meeting between the representatives of business and business associations from not just two but six countries can give a boost to integration and the creation of standards for business processes and economic cooperation between them”, Chairman of the Eurasian Economic Commission Collegium Tigran Sargsyan said. Turnover between EAEU member states and Greece amounted to roughly USD 4.6 billion in 2016. However, growth has already been seen in mutual trade in the first half of 2017 (46.6% compared with the same period last year). The participants spoke confidently about how there is currently enormous potential for increasing trade and building trade and economic ties between the EAEU and Greece. Developing cooperation and building intercountry cooperative chains with the subsequent implementation of joint cooperative projects is a key strategic area for realizing this potential today. Member of the Collegium (Minister) for Industry and the Agro-Industrial Complex of the Eurasian Economic Commission Sergei Sidorsky said: “There are already some 200 companies with Greek capital working on the territory of the Eurasian Economic Union. Of course, such numbers could be increased several times over thanks to the efforts and existing potential for developing cooperation. We view high-tech sectors of industry and agribusiness among the most promising areas for the development of cooperation with Greece above all else, he said. We invite Greek companies to take part in joint projects in the engineering, shipbuilding, light, food, and other industries”, he said. The Forum in Thessaloniki is the first step towards realizing the provisions of the Joint Declaration on Cooperation between the Eurasian Economic Commission and the Government of the Hellenic Republic dated 24 June 2017 with the aim of developing a dialogue between EAEU countries and Greece in the economic sector. The participants believe these events will help take the dialogue between Greece and the EAEU to a fundamentally new, higher level and to achieve results in expanding economic cooperation and trade relations. “I am very pleased that the discussion on issues concerning European and Eurasian integration that began on the sidelines of the St. Petersburg International Economic Forum in St. Petersburg was continued during the Business Forum ‘EAEU–Greece: A New Bridge for Cooperation and Development’ in Thessaloniki. The agreement between the Roscongress Foundation and the Greek company TIF-Helexpo signed at SPIEF 2017 contributed to the high level of today’s event. We hope that our Greek partners will take advantage of the Foundation’s invitation and that we will be able to welcome officials and representatives from the Greek business community again at SPIEF 2018”, Roscongress Foundation Director Alexander Stuglev said. Following the event, Adviser to the Russian President Anton Kobyakov and Adviser to the Greek Prime Minister Dimitrios Velanis discussed prospects for developing bilateral cooperation and further developing the dialogue between the EU and the EAEU. They also outlined plans for Greek business representatives to participate in the St. Petersburg International Economic Forum on 24–26 May 2018. 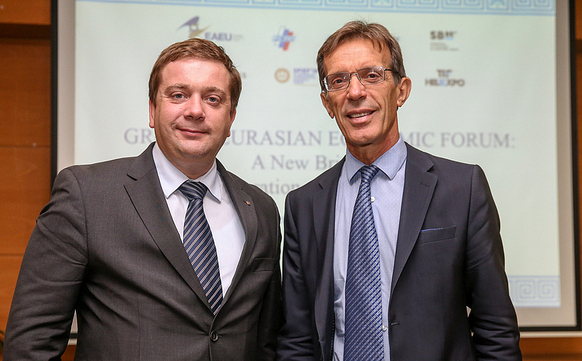 The Forum in Thessaloniki was organized by the Eurasian Economic Commission, the Roscongress Foundation, the Russian Union of Industrialists and Entrepreneurs, Enterprise Greece, and Helexpo. The event was held with the support of the Greek Ministry of Economy and Development.